Latest Report Available at Analytical Research Cognizance, “Smart Office Market” provides pin-point analysis for changing competitive dynamics and a forward looking perspective on different factors driving or restraining industry growth. Manhattan, United States - April 16, 2019 /MarketersMedia/ — Global Smart Office Market size was valued at US$ 18.96 Bn in 2017 and is expected to reach US$ 51.12 Bn by 2026 to exhibit a CAGR of 13.2 % during the forecast period. The report also helps in understanding Global smart office market dynamics, structure by identifying and analyzing the market segments and project the global market size. Further, the report also focuses on the competitive analysis of key players by product, price, financial position, product portfolio, growth strategies, and regional presence. The report also provides PEST analysis, PORTERâ€™s analysis, SWOT analysis to address questions of shareholders to prioritizing the efforts and investment in the near future to the emerging segment in Global smart office market. A smart office is an office where product allows people to work better, faster and smarter. Beacons, sensors and mobile apps support employees accomplish basic tasks better and faster, so they have sufficient time to focus on rising businesses and innovating. Similarly, in a smart office product also supports people to communicate well. Sensors are used to convey messages like presence of employee in office, there moment and even if a particular conference room is booked and for how long. Traditional sensors and safety devices as well as camera and surveillance systems to protect your workplace also newest door locks & access controllers, communicating smoke and carbon monoxide sensors and wireless detectors to confirm that everyone is protected from threats inside and outside of your office. 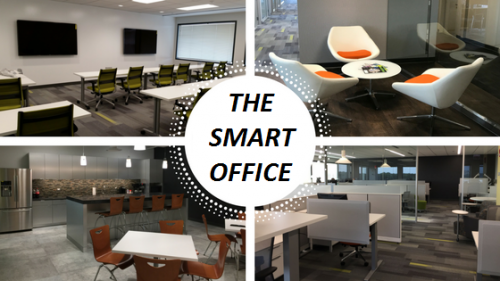 The major driving factors of the global smart office market are the rise in demand for smart office solutions and sensor networks for energy efficiency, development of IOT in smart office offerings, rising need for protection and Security Systems at the office, and favorable government procedures in several countries are driving the growth of the smart office market. The key restraint of the global smart office market is complexity in replacing the previous system due to advancement in the existing system. Also, IT and system security limits to reduce privacy interruption and data breaches are predictable as one of the major restraint for the development of smart office projects. The developing Cloud-Based environment of IOT Platforms has many opportunities in this market. The one major challenging thing of this market is an integration of actual streaming analytics abilities into a smart solution. The new construction workplaces segment is estimated to grow at a high rate in the forecasted period due to new construction workplaces offer the capacity to construct the new building with inbuilt smart office systems. Moreover, it supports in achieving eco-friendly procedures owing to economical use of the available capitals resulting in the high demand for new construction office. The Asia Pacific is anticipated to be the fastest-growing region for the smart office market, followed by Europe during the forecast period. The market in the Asia Pacific is estimated to produce at the highest rate during the forecast period due to the adoption of energy controlling solution to reduce the related cost and the employment of security and lighting organization solution in offices, eventually leading to the growth of the smart office market in the Asia Pacific.